Today's post is going way back to why I started this blog. I originally started this blog and the urging of friends. They were amazed that our grocery budget is $155 per week (it was even less when I started this blog) to feed a family of 4 including all of our cleaning products, toiletries, etc. I don't use any coupons and we eat primarily natural and as much organic as the budget will allow, which is a good amount. My friends wanted me to start this blog to show them and others how I do what I do. I've never quite figured out what my ‘secret' is and it is also not a passion of mine, so I have taken my blog in a different direction. I do have a tip that will save you money at the grocery store for you today as it is one of my ‘secrets.' We buy our meat in bulk at Costco. I usually do this with ground turkey and buy organic ground beef because we don't eat beef that often. This time, however, we were buying a bulk package of ground beef. You can save a good amount of money by buying the meat in bulk because the price per pound is lower than for one pound. In this case it was $2.89 per pound. Almost half the cost of my usual pound of organic ground beef (and for those who don't usually buy organic buying in bulk will still save money as it is less per pound). 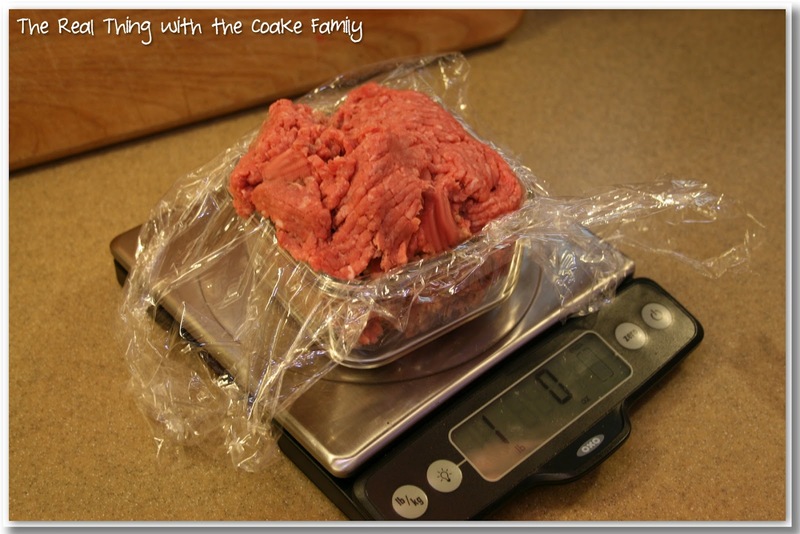 Here's what you need – the meat, plastic wrap, a container that can hold one pound of meat and a scale. I like using a square container as you can see pictured. You will see below, but I like the square because when I am done portioning out the meat, it stacks easily and neatly in the freezer bag and fits easily in the freezer. 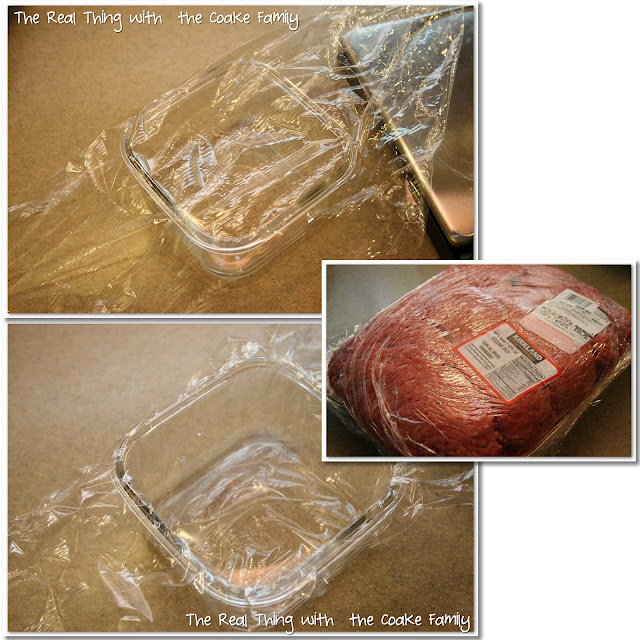 Line your container with plastic wrap, pushing it down to the bottom and sides of the container. 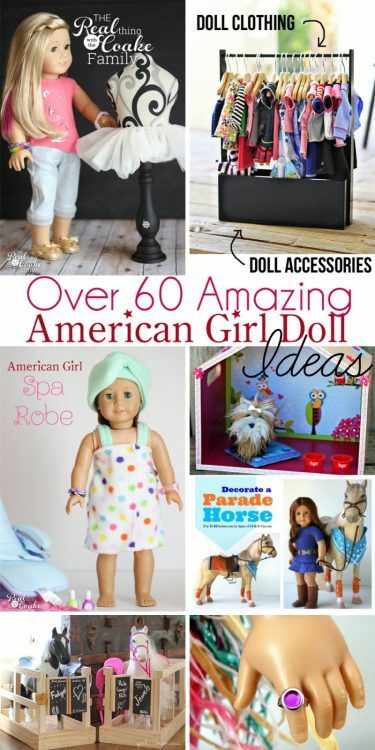 (affiliate link) if you are interested….I love it! It is a little pricey, in my opinion, but for products that work well and last, I don't mind ‘investing.' I know I will be using them a lot, which makes it worth it to me. 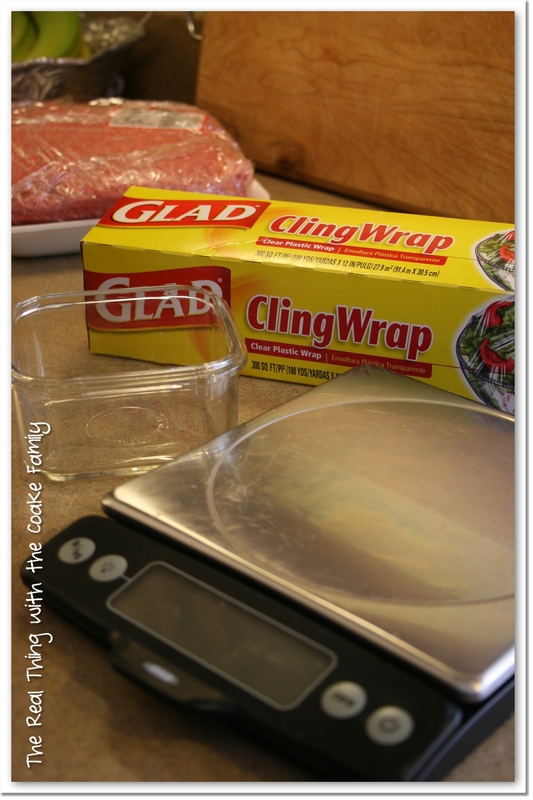 After you have weighed your meat, use the plastic wrap to push the meat into the shape of the container compacting it a little as you go. 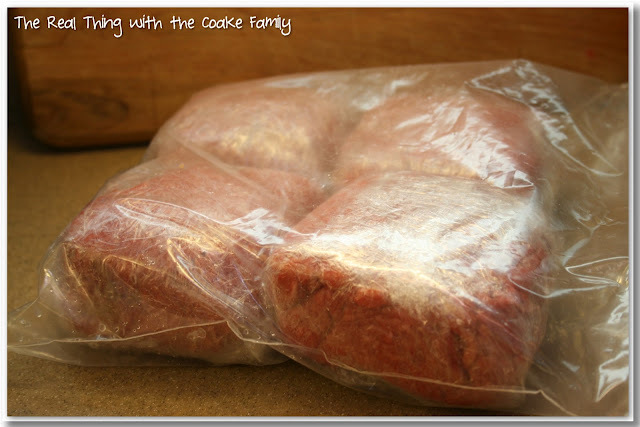 Pull the meat in the plastic wrap out of your container. I use the plastic wrap hanging over the edges almost like a handle to pull it out. Once it is out of the container, I always double wrap mine as they are going into the freezer. You can see my meat squares all stacked up above. See how easily the squares work together? All the pre-weighed meat then goes into a freezer bag and into the freezer. It takes me about 10 minutes to pre-portion everything. It is then so easy to pull what I need for a recipe as most recipes call for 1 pound of ground meat. Easy and money savings….works for me! There you go…one of my ‘secrets' to feeding a family of 4 for $155 a week(including cleaning, toiletries, paper products, etc.). 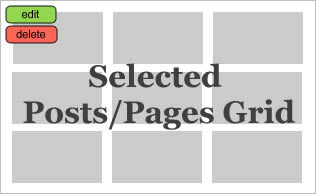 As I come up with other ‘secrets,' I'll pass them along to you. Thanks Libby! That is very sweet of you. Thanks for the great tip! I buy most of my meat at Costco and so this is a great way to package it. I really need to get a scale. We always wing it when we portion out. Ohhh…. I love my scale. I use it for so many things. I can’t imagine not having it. I had a cheapy one before this and I love my nice one. I used it while I was working to lose 40lbs…so very helpful. I still use it for tons of things….can you tell I like it! Have a great night. Thanks! I don’t have an extra freezer, but I could see where it could be quite handy. I usually fry all m ground meat in a huge skillet. Drain fat and let cool. Then I divide the meat into approximately 1# portions (i.e. if it is 6 pounds of meat, I divide into 6 portions; if it is 4, then 4 bags) and put in small, freezer, ziplock bags. Mark date w/ sharpie pen. When it is time to make a batch of crockpot beans, soup, or spaghetti sauce, I take out a bag of pre-cooked meat, run some water over it and then dump in the crockpot. I especially like this on work day mornings. Great tips! I think it has to be a great time savings to pre-cook your meat. Most of the recipes I use, I need my meat to not be cookes, but hopefully other readers will see your tip and if it works for them use it. Thanks for the great tip! I only buy meat in bulk because it saves time and money. I don’t like our local grocery store’s meat, so I either buy it through Costco or Zaycon (which sells it by 40 lbs). That’s a lot of meat to divide and store properly. Anyway, thanks for sharing your tips! Yes, 40lbs is A LOT of meat to divide and store! Wow…but I am sure it saves a lot of money. Thanks for stopping by. This is wonderful! I’m going to Costco this week. I’ll have to try it out! Thanks! ziplock freezer quart bags are great for this. put 1 pound of ground beef,pork,chicken,turkey in bag. smash flat and get all the extra air out. they stack so nice and neat and take up less room this way. i do this with both the raw and cooked meat. Great tip! I’m stuck on my square cubes because they work well for me, but others may really appreciate your tip, so thanks! So easy! I definitely need to start doing this! Glad you liked my tip. 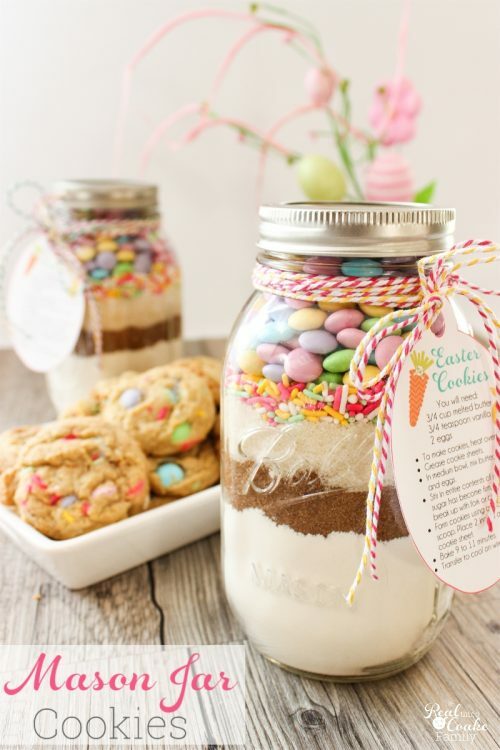 I love the plastic wrap idea! Thanks for sharing the tip. I buy ground turkey at Costco since it is cheaper than hamburger and I prefer the flavor in most things. Stopping by from Sunday Scoop! Thanks! Yes, I love Costco’s ground turkey as well. We use it tons more than beef. Works great as a substitute for most any recipe that calls for ground beef. Thanks for stopping by! Saw this from CraftOMatic. 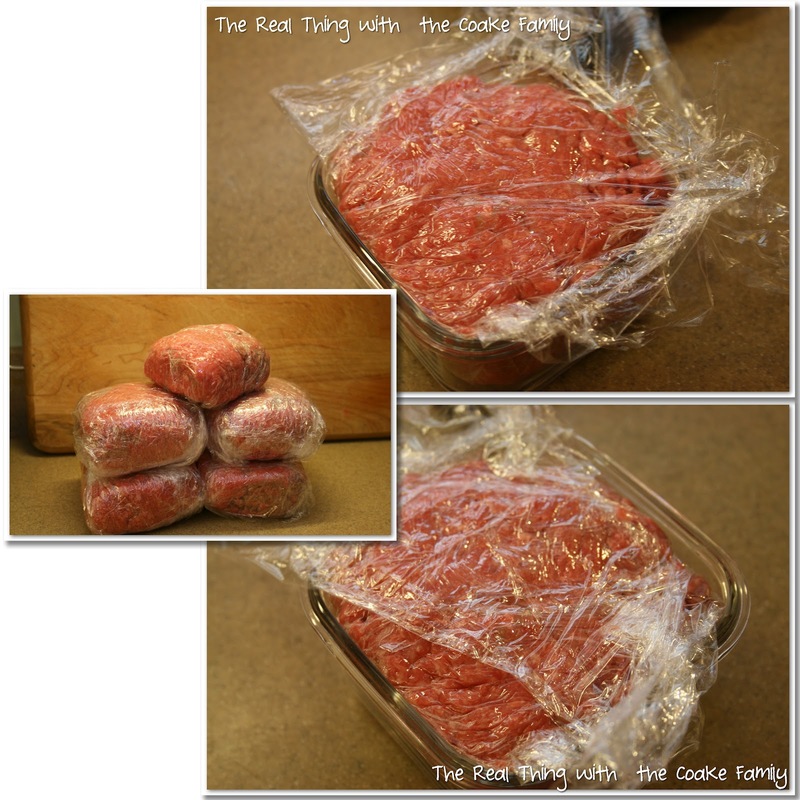 I do the same thing but use wrap and foil to prevent freezer burn. Wish I could go to Costco though because they aren’t near me (sigh). Great post! Thanks! Do you think the foil helps more than plastic wrap? I’m not sure if I could live without a Costco, so boo for you that you don’t have one near. Have a great night! That is a great tip, I like your use of the container. This is an excellent tip that my boyfriend and I live by! WE buy the giant 5lb ground beef and always divide it up! Wit only 2 people it can last for almost a month. We also buy chicken breasts in bulk as well as beans. I love cooking a big batch of beans in the crock pot and then dividing them up to freeze! I like your idea of cooking a big batch of beans and freezing those. Great idea, thanks for sharing!